I arrived in Paris early on a Sunday morning to meet up with my aunt. She had been travelling through Europe with her husband, whom we planned to send home in two days while we journeyed onto Taize. But for 48 hours it was nothing but champagne and roquefort and pain au chocolat and tartes de citron and Evian sipped in the steam bath of the spa at the Park-Hyatt. Earthly pleasures are good indeed:) My aunt had selected a gallery show for us to tour on Monday. I can’t remember now what it was— I just remember that as we were walking I began to see signs: Odilon Redon, The Prince of Dreams, Grand Palais. 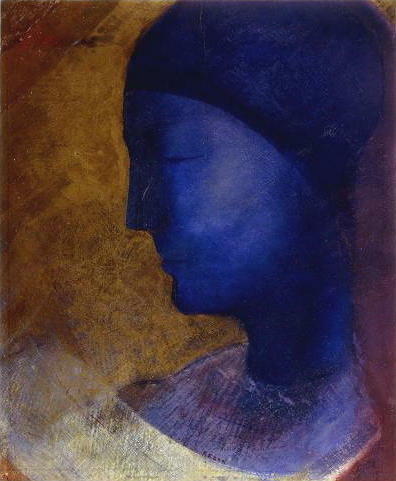 I had come to know the work of Redon when I was creating the Renaissance Service. To me his later work was like a visual representation of the music of Taize, which I had used to introduce and close out each of the arts-based vespers. We continued to walk toward the little gallery, map in hand. Arriving at the front door we exchanged just enough broken French with the greeter to realize that the show she had in mind had come and gone in June of 2010!! I smiled. “Why don’t we go to the Grand Palais? I’d love to see the Redon.” And so it was that a brisk walk later, I was surrounded by the work that had started it all, my sense of the arts as a window to the divine. The work that is represented in this blog by the ship on the right, “The Mystic Boat,” and by the tiled images of “Christ and His Apostles” that comprise the background of this very page. It was, to me, the art of Silence. The first time I ever heard a chant from Taize I was not even remotely a Christian. I was a young mother of a four-year old, and an 8-month old who had recently been diagnosed with a brain tumor. Brain tumors tend to make smart, sophisticated secularists get down on their knees and beg like babies. As my daughter lay in a hospital bed at UCLA, someone told me about a special prayer service at a nearby church: All Saint’s Episcopal Church in Beverly Hills. Huh. Strange. That was the church where I had been baptized and confirmed—not that any of that had stuck. So off I went to the Wednesday evening service. It was packed. I couldn’t figure out when the special prayer part was. I couldn’t figure out how to follow the bulletin (which, at the time, I didn’t know was called a bulletin). By the time I could find any of the hymns in the book, they were on the last verse. But then the people started singing the simplest, most hauntingly beautiful refrain I’d ever heard. “Jesus remember me, when you come into your kingdom.” Again and again they sang it til even I could not resist joining in. The people began to process forward for—what? Communion. Yes, communion. And we sang and we walked and it was warm and safe and for a moment I brushed up against the mystery of faith. That was 17 years ago. That was my first experience of Taize.